Good drugstore eyeshadow palettes are hard to come by. So many of them are chalky, dry, and are so hard to blend. I have tried so many, and there really are a lot of duds. However, you all know I find the best makeup whether it’s $5 or $50. I went through my makeup collection and narrowed it down to my top 5 favorite drugstore eyeshadow palettes. There are a lot of trios and quads that I love at the drugstore, but I’m focusing on the drugstore eyeshadow palettes that have 6 shades or more. 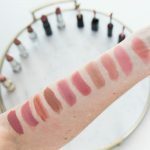 Many of us invest in drugstore eyeshadow palettes because we want a variety of shades and we want to be able to use it for many different looks. I really thought about that when putting this list together. I hope you find it helpful, and I’m sure there will be one or two things you’ll have to add to your wish list. Pixi Beauty Get the Look ItsEyeTime // This palette is in collaboration with YouTuber ItsJudyTime. This is the most expensive palette on this list at $24, so I thought I would get it out of the way first. This truly does remind me of a high end palette for half the cost than, say, Urban Decay. The quality is seriously on point. It is the perfect neutral eyeshadow palette with mattes and shimmers, and it contains 12 different shades. This is what I would definitely suggest if you only want one eyeshadow palette and don’t want to pay a lot of money. I think you would be very happy with it! Milani Everyday Eyes Eyeshadow Collection in ‘Earthy Elements’ // If you love a good warm neutrals palette, you would love this. The eyeshadows are creamy and blendable, and contains 6 shades with a good mixture of satin, matte, and shimmer. e.l.f. Mad for Matte Eyeshadow Palette // This is one of the only entirely matte drugstore eyeshadow palettes, and it is suprisingly good. The shade selection is completely neutrals, both warm and cool tones. It’s very versatile! Mattes are so hard to do, and while I feel like they’re not as great as some of my other high end mattes, they still perform well, and you cannot beat a $10 price point. e.l.f. Prism Eyeshadow Palette // This is an all-shimmer eyeshadow palette and the pigmentation is out of control! These are gorgeous! I love having this on hand if I want a nice foiled look to the lid. If you’re a shimmer girl, this will be your jam. It’s also $6.29! Say what? CoverGirl Tru Naked Roses Eyeshadow Palette // This is a gorgeous rose toned palette that has a great mix of matte and shimmer. CoverGirl released a few of these palettes with some subtle marketing hints they they’re supposed to be Urban Decay Naked Palette dupes. 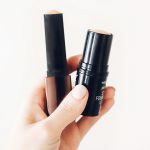 One of my most popular blog posts ever, I did half of my face with high end makeup and the other half with the drugstore dupe. I tested this agains the Urban Decay Naked 3 Palette, and I think it really is a great dupe! Not to mention the quality of these shadows are amazing, and are incredibly buttery and blendable. If you want to keep chatting makeup… skincare… haircare and more, be sure to join me in my new Beauty Chat Facebook Group! We’re having a blast. You should be there. What’s your favorite drugstore eyeshadow – palette, trio, quad, or single? Yes they REALLY are! Check out that post I linked above where I used them on one eye and the UD naked 3 on the other eye! I sometimes prefer the CG one!! Haha and thank you for your sweet compliment about my pins. I use Photoshop! Yes you would love the palette!! I’m going to give Milani a try. Looking for a good neutral palette for the summer. I love earth tones!